A Wind of Change – FINAL CASTING CALL and backstage recruitment !!! This is your last chance to take part in our community theatre project and celebrate the stories and people of Meanwood. Throughout the autumn, we’ve been working hard to create the structure of the show. After Christmas, we begin rehearsals before going in front of the audience mid-February. Confident adult singers and vocalists: must be able to rehearse Tuesday evenings. Energetic young people aged 9 – 18 years: must be able to rehearse Saturday late mornings. Backstage and technical crew and makers. Could you be part of the team? If you’re interested, get in touch with Ness as soon as possible! 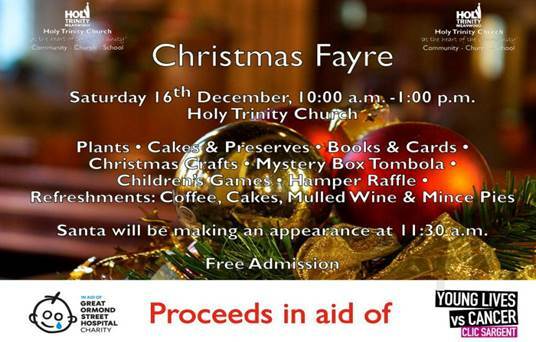 The ever popular Christmas Fayre! We’ve been told about a wonderful Christmas gesture made by Scott and the team at the Myrtle Tavern and their sister pub in Yeadon, the White Swan. They, sponsored by RDF Building Ltd, are offering a special Community Christmas Dinner for those of the older generation who need some special festive cheer this Christmas. Specifically it is for elderly relatives or maybe a neighbour who is spending Christmas alone this year, someone who doesn’t get the chance to socialise like most of us do. The Myrtle and the White Swan would like to invite them to join them for a complimentary Christmas Dinner on 21st December from 12noon. The day promises to offer a warm welcome to members of our local community who would like to enjoy Christmas lunch and the chance to chat amongst other like-minded people in the festive atmosphere both pubs have to offer. 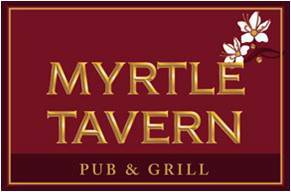 RDF Building Ltd has partnered with Myrtle Tavern Meanwood and sister pub The White Swan, Yeadon to fund and host a complimentary Christmas Dinner Party as part of their ‘Give back to the community’ initiative. If you know of someone who could benefit form this generous offer, please get in touch to book your free space and they will look after the rest. Please note: To help accommodate guests who would like to accompany somebody they know, bookings can be made for up to 2 people. Please share to help spread the word to as many people as possible. 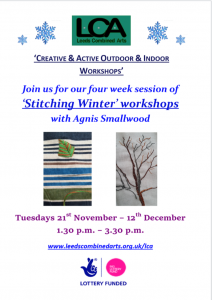 Join Leeds Combined Arts for a series of 4 ‘Stitching Winter’ workshops with Agnis Smallwood they are holding at Meanwood Institute over the next 4 Tuesdays 1.30-3.30pm. ‘Stitching Winter’ will provide the perfect opportunity to look closely at nature during the winter months and then create an individual piece of work using a range of fabrics, yarns and stitch combinations. ‘We will examine Meanwood Park over the course of the 4 weeks as our source of inspiration. We will photograph and sketch what we find to create a range of rich source material to take inspiration from. The Winter landscape will provide a fantastic starting point for exploring colour, texture and composition. Having researched different areas of the park each participant will have the freedom to create work around what has inspired them individually, learning how to translate the photographs and sketches into a textile outcome. There will be the opportunity to explore a range of fabric materials, as well as yarns and threads and how a range of stitch techniques can be used to create a beautiful outcome. This course will enable everyone to go home with their own unique piece of work as well as knowing a range of hand stitch techniques. Please do bring along a camera or smart phone if you have one to allow you to take photographs and record what we find within the park. If you have an embroidery hoop then please do also bring that along to use during each workshop. Agnis Smallwood graduated in 2009 from Cumbria Institute of the Arts in Contemporary Applied Arts where she specialised in constructed textiles. She has since worked across Yorkshire within different settings including with community groups and charities, as well as schools, museums and galleries. Agnis is passionate about facilitating workshops where people can investigate and explore for themselves, different craft techniques. Please note there will be a small contributory charge of £3 per session to cover for additional materials, refreshments and room hire’. All sessions will meet at Meanwood Institute, Green Road, Meanwood LS6 4LD and commence at 1.30 p.m. and finish at 3.30 p.m. including a short break for refreshments. 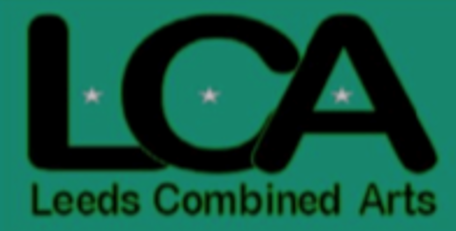 Disclaimer: Leeds Combined Arts reserves the right to alter, cancel or amend an event when circumstances arise beyond their control. However if an event has to be cancelled or changed this will always be advertised on the web-site. Participation in any event included in this programme is undertaken at the individuals own risk.